The K2 Brigade is the K2 Anagram with a little step towards all mountain riding and not a bad entry level all mountain board.The extruded base is probably the only drawback. On Snow Feel: One of the most difficult things to happen when you are learning is to catch an edge. 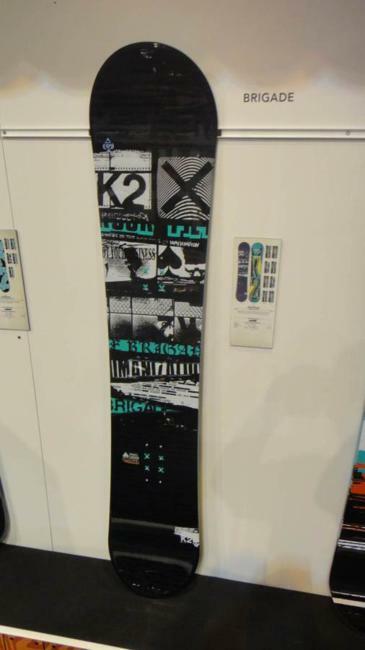 K2 has some tech that will allow you a more catch free ride and maybe make you a little more stoked on all mountain riding. This is also very stable between the feet making it a very stable cruise the groomer kind of board. It’s very easy to one foot off the chair and get through longer flat sections. Powder: The powder performance is somewhere between their flatline tech and their all mountain rocker tech. The set back helps the rider get more float in the nose and the little bit of rocker in the tip and tail makes the board plane pretty well. The nose doesn’t like to sink but it can on occasion. Speed: An extruded base is less expensive and more sturdy but a bit slower than the very common sintered base you see on most snowboards. This is very close to a completely flat camber shape. Still this is what you would expect for the price and riding level and it’s much more maintenance free than sintered bases and that makes it better for people like beginners who don’t want to wax their board a lot. Edge Hold: Pretty good here. It’s not bottomless and not slippery. It’s right in the middle. If you are a beginner/intermediate you don’t want to go out and ride in harder conditions so this should be fine for you. Flex: Right there in the medium/soft world. Nothing difficult to flex at all. It’s nice and forgiving. Switch: With the stance centered up this directional twin can teach a beginner to ride switch very well. Jibbing: Not an ideal jib board but not bad either. You can for sure hit up the jib park with this board if you want to get the hang of some mellow boxes and such. Pipe: This mostly flat profile isn’t ideal in the pipe but it’s ok if you want to hit up the pipe when it’s soft to see if this is your thing. Jumps: It’s not a pop star but as a beginner you will be more concerned about not catching an edge and linking turns. The flat past the binding does give you some ollie power so it will be good for learning how to create your own air. We try to get as many images of the K2 Brigade, but forgive us if they're not all there. Purchased the K2 as my first board and was very happy until the start of my second season on it. Season 1: I strapped in with some flow bindings and the fun began. This board gave me more confidence on the slopes right away then I had previously experienced. This board can do ANYTHING a beginner would want to do on a board. I used this board in every condition following around my friends who've lived on the mountains for years. For the most part this board handled everything I could throw at it. Flex - contrary to what people say about the board it has a very stiff characteristic to it, I believe this is because the board as low tech and the flex remains constant throughout the entire board. Speed - does get chattery at high speeds but it doesn't buck you off when flying over uneven terrain. Powder - This board does have rocker tips to help float in powder, I'd recommend setting it back slightly on powder days just to avoid the tip sinking at low speeds. That being said, still had those "can't stop laughing days" on this one. If you're a person who goes up 3-8 times a year and want a good solid reliable board that can handle it all look no further, this board is made for that lifestyle. If you're looking for a board to take you to the next level then keep looking. 5 stars from all my beginner friends who use it now! Gavin's review is amazing. I completed season 1 on this Big Bertha Brigade, a 163W, and found it felt huge, as noted in Gavin's review. After a few changes in technique I switched to a more responsive board for season two and found what the Bertha was lacking - more edge control and more control, less 'surfy' feel. However I will always love the Brigade for how easy it was on my a$$ learning to board. It was so hard to catch an edge! I was doing skidded turns down greens so quickly with the Bertha Brigade that it made me fall in love with snowboarding fast. 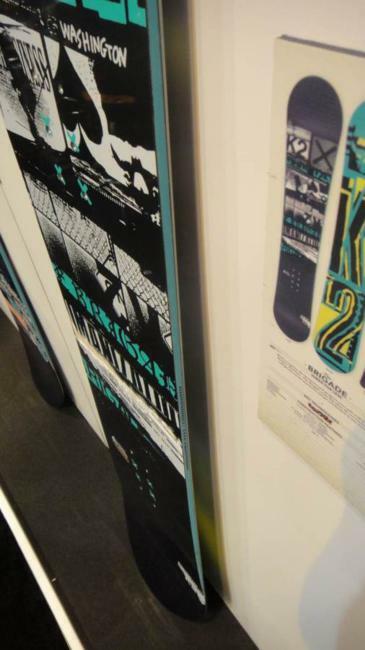 I don't like K2 graphics and prefer more 'old school' plain and simple stuff, but I'll never get rid of the Bertha - it'll become the board I lend out, especially to those who want to give snowboarding a rip as a beginner. Its hard not to love a board that makes you fall in love with riding. I have the 2010 model and I wouldn't call it "flat to rocker". It has the catch free rocker in the ends which gets engaged when you load the board but it's definitely a camber profiled board, although not a real deep camber. I don't think it has changed over the years either. It is a very stable ride, and probably too stable. I have the 163 wide and unless you have about size 14 feet I wouldn't recommend this board if looking at wide boards, it's just too wide. The waist width is about 270mm and the tip and tail are nearly 320mm. The catch free rocker does actually work, and with detuned contact areas beginners have a lot of confidence on this board. But the catch free rocker doesn't work like proper rocker profiles in making boards ride smaller, this board still rides quite big, obviously the 163wide is a big bit of plank but I'm 6'2" / 210 lb so most of my boards are quite big but I feel it on this one. Flex is about perfect for a beginner board, not a noodle but plenty forgiving at low speeds. This board has an extruded base but with a good base structuring and good wax job speed is not a problem. I think the big waist must help with the big 163wide but this thing just cruises past everybody in flat areas. I use my brigade for lending to friends wanting to come out and learn to ride and even first timers slowly chug along cruising past everybody unstrapping on flat sections even tho my board is a banged up beast, I have ground the base twice now with an orbital sander and use it to practice board repairs, it has an edge section replaced, as much base repair P-tex as original base and I structure the base by hand with 80 grit sand paper, yet it is still a fun board for people to learn on and keeps speed on any snow. I guess that might be it's best point, it is great value as can be found pretty cheap and will last for ages. I haven't used mine for a few years now myself but it gets hammered by beginners and keeps on going. The main negative would just be the big feel and that I believe newer camber profiles are a better buy for a beginner, hybrid camber boards give as much stability, ride smaller and can progress better as you get better, even if you want to get into some powder. I was going to give it three stars but after writing this I felt bad for the big girl, she gets a beating but keeps coming back for more and puts up with all the beginners so I gave it 4 HAHA. If you're looking for your first board and see this cheap, be mindful of the size you get, check waist width and lean slightly towards a shorter length than you might otherwise pick and you won't go too wrong, confidence is really important for a beginner to progress and this gives it in spades, it just won't progress with you too far.